TORONTO, ONTARIO--(Marketwired - May 31, 2016) - Editors note: There is one photo associated with this press release. Green Roofs for Healthy Cities (GRHC), the green roof and wall industry association, is pleased to announce the industry grew 18.5% with Washington, D.C. as the number one region for green roof installations in North America according to its 2015 Annual Green Roof Industry Survey. Washington, D.C. will host the 14th Annual CitiesAlive Conference from November 1-4, 2016, focusing on stormwater in the Washington, D.C. Metropolitan Region. "Green roofs are a key strategy for mitigating the heat island effect in our city and for effective stormwater management," said Tommy Wells, Director of the District of Columbia's Department of Energy and Environment. "They also play an important role in achieving our Sustainable DC goal of reducing carbon emissions by 50% by 2032. I'm proud the DC area has, for the fifth time, been named a national leader in green roof installation and we will continue to lead in this area for years to come." 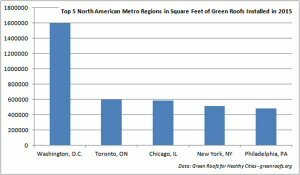 1,595,957 square feet of green roofs were installed in 2015, attributed to Washington's public policies and programs that support stormwater management through green roof investment, including rebates of $7-$15 per square foot of green roof installed and credits that reduce stormwater fees. "The 18.5% increase in green roofs installed in 2015 is in sharp contrast to the previous year's 12 percent shortfall, adding market growth to the 2013 total, the last year the industry saw positive growth. We estimate that these installations will help retain 76.3 million gallons of stormwater." said Steven Peck, Founder & President, Green Roofs for Healthy Cities. 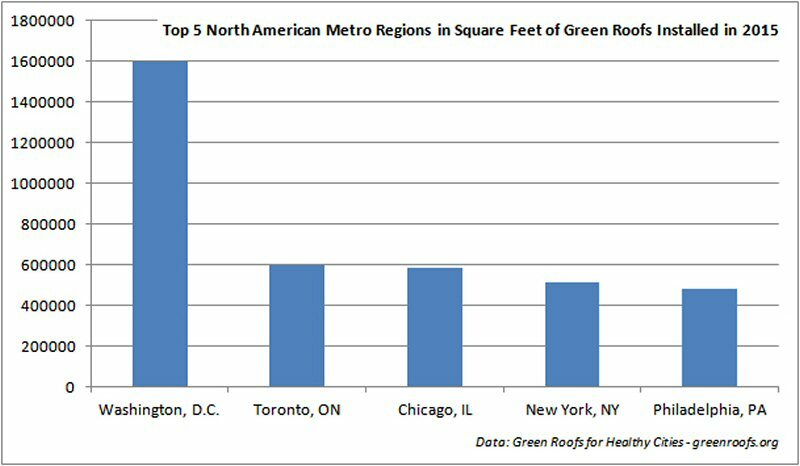 The Toronto metropolitan region ranked 2nd among North American cities for a second year, with 594,710 square feet of green roofs installed. The Green Roof by-law of 2009, requiring green roofs on most new buildings, has resulted in the permitting of more than 2.6 million square feet of green roofs. Green Roofs for Healthy Cities (GRHC) mission is to develop the green roof and wall industry across North America. For the 2015 Annual Green Roof Industry Survey highlights, go to www.greenroofs.org. In 2016, GRHC is holding its annual conference, CitiesAlive: 14th Annual Green Roof and Wall Conference in Washington, DC, November 1-4 - www.citiesalive.org.